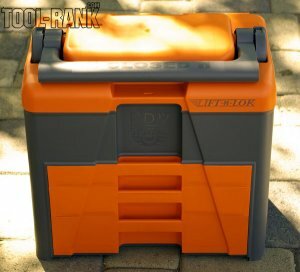 Today we are taking a look at the Lift-n-Lok tool organizer by PDY systems. If you go into any store looking for any toolbox, craft box, tackle box, or whatever box, you will notice one thing in common. They have some type of exterior latch or catch that is used to keep them secure. This is where the Lift-n-Lok goes beyond the norm, and sets a new paradigm. It features zero external latches or catches. So how does it work? Well, it is all in the handle. With the handle in the forward or upright position with the drawers closed, all the compartments are in the locked position. With the handle in the backward position, all the compartments are unlocked. You can also add a padlock to the mix, to keep your tools from walking away. I know its cool, but it goes ever further. All toolboxes need a small margin of clearance so the drawers can slide in and out smoothly. The Lift-n-Lok closes these clearance gaps when it is in one of the locked positions. This means that even the smallest item placed in one of the drawers divided sections will not be able to jump sections while the Lift-n-Lok is locked. To test this, I used some of my mom’s smallest beads that are about 1/16 of an inch in diameter, and placed them in the various dividers of the Lift-n-Lok. I then proceeded to shake it like I was mixing a can of paint, only stopping after I got tired. The outcome was amazing considering the size of the beads. There was absolutely zero contamination, or divider jumping beads. The Lift-n-Lok is very well built, and is proudly made in the USA. You have a color choice of Orange/Grey, Blue/Grey, or Green/Brown fishing tackle box. It is constructed out of Polypropylene, and weighs in at 9lbs 10oz. When you first pick it up, you can tell how strong and sturdy the box is. The handle itself, although hollow, is very thick, and can probably stand up to anything you throw at it. Included with the Lift-n-Lok are 10 dividers for the top drawer, and 5 dividers for the middle drawer. The dividers are some of the best I have seen. They actually look a little thicker then the built in wall dividers. The grooves that hold the dividers are also very well built. The dividers are actually keyed to fit into the side grooves, and also rest inside of a bottom groove. So three sides of the dividers are completely held to prevent any movement from accruing. Time to fill her up. The Lift-n-Lok has a lot of little sections if you end up using all of the dividers, or some longer sections if you choose not to. You can see I filled up the top section, with some of my bigger hand tools, and a cordless impact. There was also room for a bit more, but I was running out of tools on hand. The top drawer is perfect for screws, bolts, wire nuts, etc. I filled it up with a little of everything, from drill bits and screws, to Dremel bits. The middle drawer is a little deeper, and works great for more hand tools, your Bosch DLR165K, and some wall anchors, and more of anything. The bottom drawer is even deeper and works very well for holding my cordless Dremel, Dremel charger, extra battery (if I had one), and more hand tools. Go to PDY Systems for a Diagram of all the Drawers. I am very impressed with the design, construction, and quality of the PDY Systems Lift-n-Lok. At a price of $59.95 + S&H, it puts the Lift-n-Lok right in the same price range as any other good quality toolbox. It can be used by just about anyone, from kids to adults. RC hobbyists, and pros like it, because it can hold everything from small screws, extra tires, batteries, and chargers. My mom wants one to store her beads, and necklace making tools. My dad wants one to replace the toolbox in his truck that he sometime forgets to latch, and ends up with tools everywhere. It may seem like I am trying to sell the Lift-n-Lok to you, and that is because it is that good of a product. The only place you might run into problems is if you have longer tools. This is where I would make a suggestion to PDY Systems. You might want to consider offering a few different drawer configurations, maybe with longer dividers running the width of the drawers. The Lift-n-Lok gets 5 out of 5 stars.